New Communities Inc. Founders - New Communities Inc.
Reverend Sherrod (born 1937) was SNCC’s first field secretary, and SNCC director of Southwest Georgia. His leadership led to the Albany movement after a student sit-in at the local bus station (to test a recently enacted desegregation law) led to a years-long campaign that ultimately involved Martin Luther King Jr. and the intervention of President John F. Kennedy. He traveled to the historic (and almost all-white) 1964 Democratic National Convention, when the Mississippi Freedom Democratic Party fought for more black representation. He was jailed several times and stayed with SNCC until 1966, when Stokely Carmichael became chair and whites were expelled, but he’d already become more focused on his work in southwest Georgia than SNCC politics. Sherrod got his Masters of divinity degree from New York’s Union Theological Seminary, then returned to Albany to found the Southwest Georgia Project for community education. In 1969, Sherrod, his wife Shirley, and some other members of the Albany Movement helped pioneer the land trust movement in the U.S., co-founding New Communities, a collective farm in Southwest Georgia modeled on the kibbutzim in Israel. He served as an elected member of the Albany City Council from 1976 to 1990. “We tend to think of civil rights workers as people who it was an episode in their life before they went on and did something else,” says Clayborne Carson, SNCC historian and director of the Martin Luther King Jr. Research and Education Institute at Stanford. “But Sherrod is an exemplar of those people who didn’t leave the movement. They stayed, and they’re still fighting, to this day. Mrs. Sherrod was born in Baker County, Georgia on November 20, 1947 to Grace and Hosea Miller. Her father who was a deacon at a local Baptist Church, was shot to death, reportedly over a dispute about livestock. No charges were returned against the shooter by an all- white grand jury. The tragic murder of her father, when she was 17 years old had a profound impact on her life and led to her decision to stay in the south to work for change. 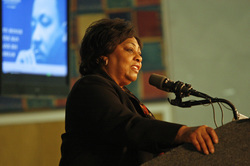 She attended Fort Valley State College beginning in September, 1965. After two years, she transferred to Albany State College where she received her bachelor's degree. There she studied sociology while also working for civil rights with the Student Nonviolent Coordinating Committee (SNCC). During this time, she married Reverend Charles Sherrod, one of the founding members of SNCC and the leader of SNCC's work in southwest Georgia. In 1969, Mrs. Sherrod and her husband helped form New Communities, Inc., a land trust that held 6,000 acres of land in Lee County, Georgia. According to land trust activists, New Communities, being connected to the Albany Movement, served as a laboratory and model in the movement toward the development of Community Land Trusts throughout the United States. The perseverance and foresight of New Communities, motivated by the right of African American farmers to farm land securely and affordably, initiated the Community Land Trust Movement in the US. Mrs. Sherrod earned a Master's Degree in Community Development from Antioch University in Yellow Springs, Ohio. She worked for more than 24 years with the Federation of Southern Cooperatives/Land Assistance Fund as the Georgia Field Director. She was recognized by many organizations in the United States for her work with limited resource farmers. Sherrod was appointed by the Obama Administration as USDA Georgia State Director for Rural Development in 2009. She was the first black person to hold that position. Currently, Mrs. Sherrod is the Executive Director of the Southwest Georgia Project for Community Education, Inc., an organization she helped to create in 1971. She continues her work with farmers and rural communities.